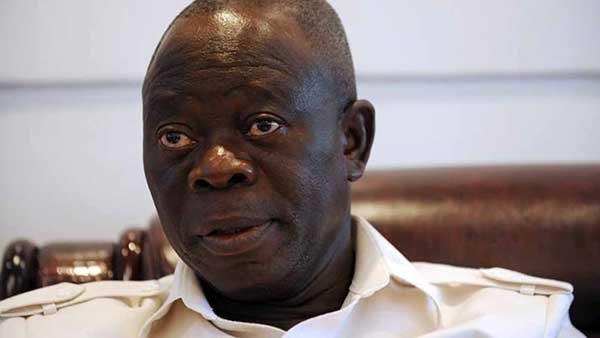 The embattled National Chairman of the APC, Adams Oshiomhole says Governor Ibikunle Amosun of Ogun State is blackmailing him so that he could succumb to the governor’s selfish desires. The governor had, on Sunday, led a delegation of leaders from Ogun State to the official residence of the President at the Presidential Villa, Abuja, over the ongoing controversy concerning who would fly the flag of the APC in the state governorship election in 2019. Those who attended the meeting include: Alake of Egbaland and Chairman, Ogun State Council of Obas, Oba Aremu Gbadebo; the Olu of Ilaro and paramount ruler of Yewaland, Oba Kehinde Olugbenle, and a former Minister of State for Education, Senator Iyabo Anisulowo. The national leadership of the party had endorsed Dapo Abiodun, who is from Remo, as the party’s candidate while Amosun was supporting the candidature of Adekunle Akinlade, from Yewa. There were newspaper reports that during the meeting with the Ogun State leaders, the President issued an ultimatum to Oshiomhole to ‘clear the mess’ which emanated in the wake of the governorship primaries in some state chapters of the party and Ogun State. Amosun also accused Oshiomhole of conniving with a cabal in Lagos to write fake results after the party’s primaries which produced Dapo Abiodun as the governorship candidate. However, speaking through his aide, Oshiomhole said he is surprised by the statements in the media that he was given a matching order by President Buhari to clear the mess. According to him, the news is a figment of the imagination of the sponsors as Oshiomhole was not in attendance when the President hosted the leaders from Ogun State. The aide said: “There was nothing like that. The report was sponsored by Governor Amosun in his desperate attempt to ensure he has his way at all cost. Oshiomhole was not even present at the meeting the President had with traditional rulers from Ogun state. “Amosun was the one who told journalists that that was what the President said during the meeting. There was nothing like that. Rather, the President told Oshiomhole to be firm, insist on due process and resist any form of impunity.